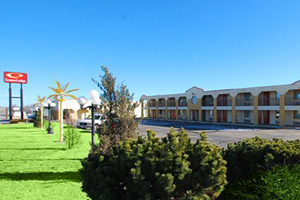 The Econo Lodge hotel is located on historic Route 66, near Pioneer West Museum. This hotel is a great place to stop when traveling to Texas, Oklahoma, New Mexico or Arizona. The Shamrock Golf Club is located near the hotel, and the U-Drop Inn Restaurant and Tower Service Station, two local landmarks, are minutes away. This hotel is only 75 miles from Amarillo, the home of the Big Texan Restaurant, Cadillac Ranch and the Amarillo International Airport. Shamrock is also home to one of greatest local St. Patrick’s Day festivals each March. Guests of this Shamrock hotel will enjoy amenities, including free continental breakfast, free local calls, free golf (see the front desk for details) and is a pet-friendly hotel; small fee applies. After a long day of work or play, guests will enjoy relaxing in the seasonal outdoor pool. Business travelers will appreciate access to copy and fax services. There is an on-site meeting room available to accommodate most events and business functions. All guest rooms include cable television. In addition to standard amenities, refrigerators are included in some rooms. Non-smoking rooms are available upon request. Route 66 Inn is located in Shamrock. Free WiFi access is available. Each room here will provide you with air conditioning. 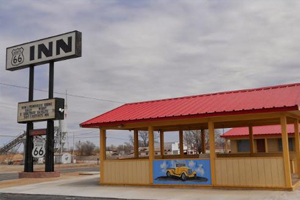 At Route 66 Inn you will find a 24-hour front desk, a garden and barbecue facilities. The property offers free parking. 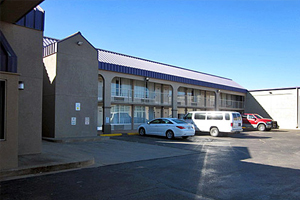 This motel is conveniently located on Interstate 40 in Shamrock, Texas. The pet-friendly motel offers free Wi-Fi. A 39-inch flat-screen TV with cable channels is featured in each soundproofed guest room at Motel 6. A microwave and refrigerator are provided. The 24-hour front desk is available for assistance and late check-in. Motel 6 Shamrock has a vending machine stocked with soft drinks. The historic Tower Station and U-Drop Inn is less than 1 mile from the motel. Shamrock Municipal Airport is within 10 minutes’ drive. 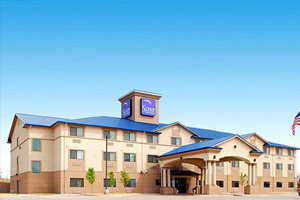 The Sleep Inn & Suites hotel is located off Interstate 40, providing easy access to many local points of interest. This hotel is close to the historic U-Drop Inn, once known as the “the swankiest of swank eating places” on Route 66. The Pioneer West Museum and the Shamrock Country Club are both just two miles away. True to its Irish heritage, Shamrock’s Elmore Park is home to a monument featuring a fragment of the original Blarney Stone, pried from the ruins of Blarney Castle in Ireland. The city also hosts an annual St. Patrick’s Day celebration, offering an arts and crafts show, a carnival, a parade and much more. The surrounding area offers a variety of shopping centers, restaurants and movie theaters. This hotel offers guests a great selection of amenities, including free Morning Medley Hot Breakfast, free high-speed Internet access, free local calls, indoor pool & hot tub and exercise room. Business travelers will welcome additional conveniences like in-room desks and access to copy and fax services. All spacious guest rooms come equipped with microwaves, refrigerators, hair dryers, coffee makers, irons and ironing boards. Some rooms feature sofa sleepers. Non-smoking rooms are offered. Ample parking and guest laundry facilities are provided on the premises for added convenience.